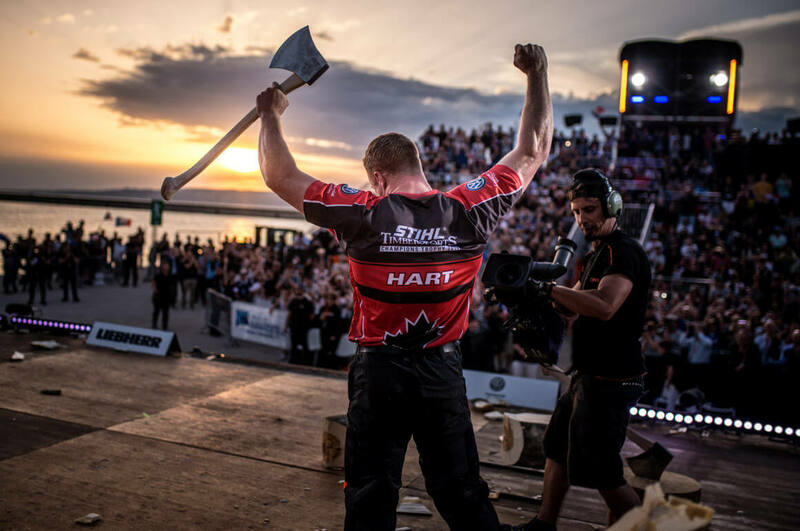 Smashing through logs in seconds is the name of the game at the TIMBERSPORTS® Champions Trophy, an yearly international endurance event where the world’s top competitors go head-to-head in the world’s original extreme sport. And this year, Stirling Hart of Canada was finally victorious after missing out by a millisecond in the 2017 Champions Trophy final against Australian competitor, Brad De Losa. If you haven’t seen TIMBERSPORTS® in action yet, then you don’t know what you’re missing out on – a sporting spectacle where power and speed are absolutely essential, the TIMBERSPORTS® Series developed from lumberjack competitions where foresters would compete against each other outside work, testing their skills and strength. It comes as no surprise that these sorts of contests originated in Australia, where sport and healthy competition are part of the national culture! The sport grew over time and the official TIMBERSPORTS® Series began in 1985 with an official set of rules. It also now has a standard number of events or disciplines – three with an axe and three with a saw. You can find out more about the six disciplines in this video. 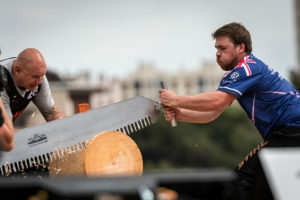 Many countries around the world already hold their own national TIMBERSPORTS® championships, with the British Championship taking place every August as part of the BBC Countryfile Live event at Blenheim Palace. The winner of the British Championship has a chance to qualify for the Individual World Championship, which takes place every year in autumn. But if they have completed the events at top speeds, they also get the chance to qualify for the Champions Trophy, where the 12 best athletes in the world take each other on in a knock-out competition with a twist – instead of completing the disciplines one at a time, they must complete four events in quick succession one after the other. Whilst strength is always a key part of a TIMBERSPORTS® athlete’s arsenal, stamina is the name of the game when it comes to the Champions Trophy. 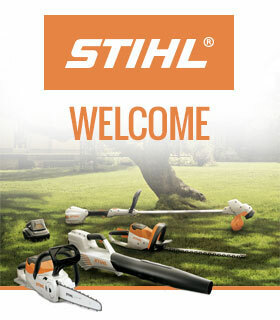 Competitors must first saw through a 40cm pine log with a STIHL MS 661 C-M chainsawin the Stock Saw event, then chop through 28cm of poplar with a racing axe whilst standing on the log in the Underhand Chop. Next, they must saw through another 40cm of pine with a 2-metre long Single Buck saw, and finally, the athlete grabs another racing axe to smash through a 27cm poplar log in the Standing Block Chop. The impressive World Record for this remarkable relay is held by Australian Brad De Losa, when he completed the event in 57.59 seconds at the 2015 Champions Trophy – that’s under a minute to chop and saw his way through four logs. Times at the 2018 Champions Trophy, held next to the iconic MuCEM building on the waterfront in Marseille, France, didn’t quite reach record-breaking levels, but Mitch Argent, the athlete from Australia, was agonisingly close in his quarter final against Michal Dubicki from Poland, with a time of 58.12 seconds, just 0.13 seconds away from the World Record. One of the pre-tournament favourites, Mitch looked like he was the one to watch after he beat last year’s winner, De Losa, in the Australian qualifying event. But Stirling Hart had other ideas, when he met Mitch in the semi-finals. 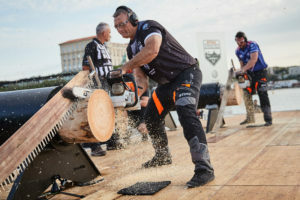 Knowing that they were one win away from the final, both men gave it their best shot, with Argent sawing through the first log slightly quicker than Hart. By the end of the Underhand Chop, the athletes were neck and neck as they picked up their cross-cut saws. As is often the case, the Single Buck proved the real test of stamina and Hart had the edge as he powered through the pine, reaching the final log and the Standing Block Chop split seconds ahead of Argent. And tiny margins are what counts in the Champions Trophy, with Hart eventually beating Argent by 0.82 seconds to progress through to the final. The other semi-final saw Jason Wynyard, the 9-time World Champion from New Zealand, taking on Martin Komarek from the Czech Republic. Despite nursing an injury, Wynyard’s experience shone through and he progressed to the final with three seconds to spare over Komarek. In the final, however, the injury proved a hindrance too much for Wynyard and Hart’s fitness was the deciding factor. Hart had delivered consistently fast times all the way through the competition – Wynyard’s quickest time was 1:07.12 in the quarter final, which was still nearly four seconds slower than Hart’s slowest time. Hart was elated at winning after losing so narrowly in 2017. The up and coming stars of the sport also had their chance to shine with the Rookie World Championship taking place hours before the Champions Trophy on the same stage. Australia showed their dominance on the TIMBERSPORTS® podium, with the Australian rookie, Daniel Gurr taking the winner’s medal. 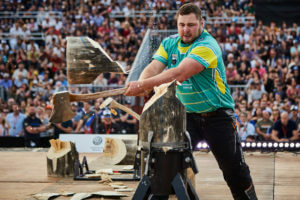 Australia have featured on the podium at 9 of the last 10 international TIMBERSPORTS® events and the new crop of young stars developing in Australia suggests this trend will continue. Gurr achieved a personal best in each of the four disciplines that the rookies compete in at the Championship: the Stock Saw, the Underhand Chop, the Single Buck and the Standing Block Chop. Great Britain’s Jack Easen also took part in the Rookie World Championship. Jack achieved the second best times in Europe last year to qualify for the Championship, but in a particularly strong field, Jack could only manage eighth. He did achieve a new national rookie record in the Single Buck, sawing through a 40cm pine log in just 12.20 seconds. After such an exciting event, the focus for all the athletes now turns to their own National Championships and qualifying for the World Championship. This takes on extra significance for the British athletes this year, as they will get the chance to compete in front of a home crowd with the 2018 World Championship taking place at the Echo Arena Liverpool on 19and 20 October. Get your tickets at www.echoarena.com/timbersports.